Though you might not think of ants as formidable bodyguards, some do an impressive job protecting plants from enemies. Now, scientists at the University of Toronto (U of T) have determined what makes some better bodyguards than others. Examing the relationship between the Amazon rainforest plant Cordia nodosa in Peru and the Amazonian ant Allomerus octoarticulatus, they found the degree to which the ants express two genes significantly impacts the amount of protection they provide to their hosts. 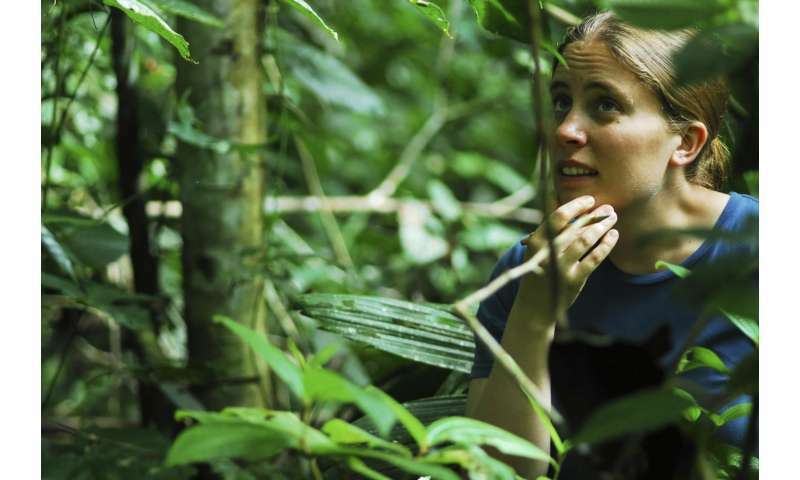 "Around 400 species of tropical plants have evolved specialized structures called domatia to house ant colonies that defend them, mainly against herbivorous insects," said Megan Frederickson, associate professor in the Department of Ecology & Evolutionary Biology at U of T and senior author of a new study published in Proceedings of the Royal Society B. "Because there are many, many arboreal ants in rainforests, tropical trees are often completely covered in ants." 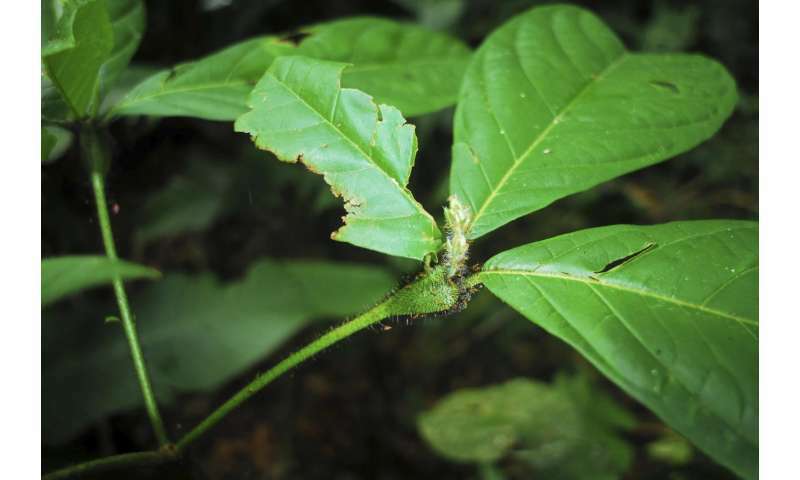 "The plant we studied is attacked by grasshoppers, beetles, and caterpillars, and although these insects are small, they can do a lot of damage to trees," she said. "And since ants eat a lot of insects and other arthropods, they reduce the density of such herbivores on the trees." The researchers zeroed in on two genes of Allomerus octoarticulatus that regulate foraging behaviour, knowing that how an animal forages for food often determines how much benefit its plant partner receives. Working in the field in the Peruvian Amazon, they fed some colonies a chemical that increases the activity of the genes' products, and observed how it changed ant behavior. They then collected the ants and brought them back to Toronto for molecular analysis. 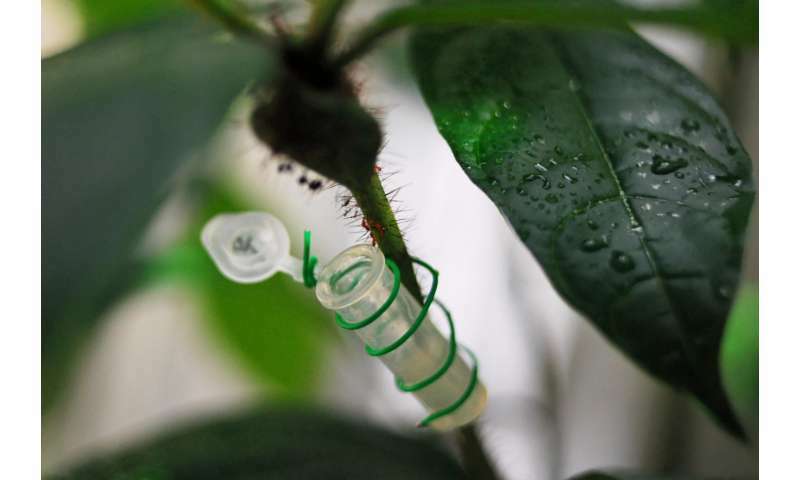 "We found that when we activated the products of these two ant genes, more workers were recruited to attack herbivores, resulting in less damage to the trees," Frederickson said. "Gene expression in ant workers was also correlated with whether an ant colony discovered a grasshopper and how much damage was inflicted on leaves." The findings are reported in the paper "An ant-plant mutualism through the lens of cGMP-dependent kinase genes" in the September 13 issue of Proceedings of the Royal Society B. The research is supported by funding from the Natural Sciences and Engineering Research Council of Canada (NSERC) and the Canadian Institute for Advanced Research (CIFAR).